Drougkas, A.; Molins, C.; Roca, P.
A set of experimental tests to determine the compressive strength of masonry stack prisms has been numerically simulated using a combined plasticity-smeared crack constitutive law employed in three-dimensional analysis. Supported by an experimental campaign for the mechanical characterization of lime mortar masonry, a series of finite element analyses was performed in an attempt to assess the capacity of the model to reproduce the results obtained in terms of capacity, failure mode and global stiffness. The constitutive law used for the non-linear analysis of the masonry is a combination of a smeared cracking model in tension and a pressure dependent plasticity model in compression, which is capable of accounting for all failure mechanisms that may arise in concentric compression of masonry, both in the units and in the mortar. The purpose of this investigation is to establish whether a numerical approach based on the micro-modeling method is suitable for the simulation of the salient features encountered in masonry under compression as well as highlighting the main material properties necessary to be determined in order to properly model such experiments. The results are expanded upon through a parametric investigation. 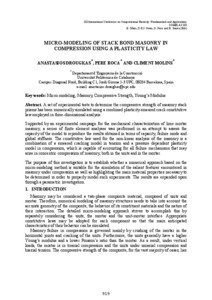 Drougkas, A.; Molins, C.; Roca, P. Micro-modeling of stack bond masonry in compression using a plasticity law. A: International Conference on Computational Plasticity Fundamentals and Applications. "Computational Plasticity XII: Fundamentals and Applications". 2013 ed. Barcelona: CIMNE, 2013, p. 919-928.